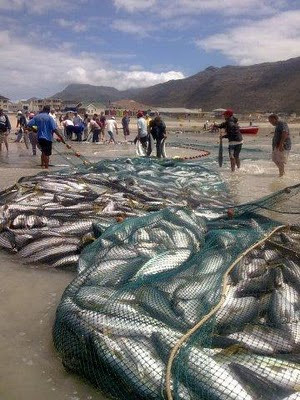 Commercial fishing abuse of fish stocks, if this were spearfisherman we would be banned in a day! Imagine this was a spearfishing competition? The public outcry would be insane. We can invest in SAUFF who like it or not is our future and the only defense we have at this point. And lastly find / take every opportunity to educate people about the selective nature of spearfishing and the realities involved to actually go and get a fish. Emil Pirzenthal's 63kg Giant Kingfish a Record? Emil Pirzenthal 63kg Giant Kingfish - Caranx Ignobilis a Potential Record? When it comes to shooting Giant Kingfish Emil is the man. Living at Umkomass he has the Shoal wired ... and the Kingfish too! He is well known for bring home a couple Iggies over the 20-30kg mark at a time. Most of us would just be happy with one in our life times. From what I understand Emil's strategy is to dive in the very late afternoon on the Shoal ... I am sure he also has the spots down pat aswell. 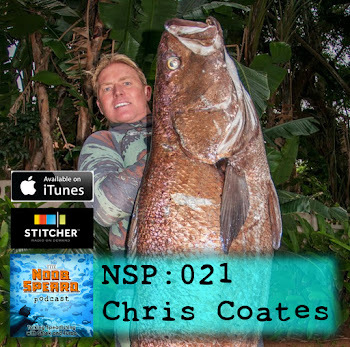 Here is the think he actually targets these fish, just like we go and target Couta or Snoek! So I guess this is not one of those occasions where you say "lucky fish"
Matt Coningham coming right for the first time. Christmas Bay Couta 16kg. This weekend saw some good diving conditions all along the coast. The sea got progressively better as Saturday progressed and alot of guys jumped in to break the week long no spearfishing drought. I think everyone was thinking COUTA when they saw the water, but it was strangely quiet and there were only a few snoek around. I heard of one couta of Tiffs .... out of a number of guys that dived there. Matt however took the cake, he is fairly new to diving but with living on the beach and being probably one of the fittest guys around .... this guy runs the 4km in like 13min or something .... apparently you must check is 20km! So throw all that together and Matt is on his way... often having loads of practice on the snoek that frequent his front doorstep. Anyway Matt smacks this Couta and calls me up all excited and wanting to weigh it. His next door neighbor an expert fisherman ... every fisherman is an expert, well so it seems. Tells him its over 20kg. So Matt is frothing, but wanting to make sure he calls around looking for a scale and lands up at my place. The digital scale does not lie and it comes to a respectable 16kg! Not bad for the first time!! Sunday was another good looking day, I got 2 snoek out in the deep while looking for Couta ....I was amped after Matts fish :-) I heard of a couple snoek but not much else. The guys tried their luck again in the afternoon, but there were only a few snoek in the shallows again. Well thats with the exception of Mr Matt Coningham .. who if my info is right went out again and shot another Couta!! Once the cherry has popped some times it just keeps flowing!! Yesterday the sea tempted me to get in and try out my new Liquid Image Camera Mask 320. The viability was real bad but I still managed some fish. The camera mask took some surprising footage and I think that with a little getting used to ...plus some cleam water this could be a serious winner! The dive looks promising for later in the weekend. Maybe we will get some clean water and a couta on film! Look what has just landed on my desk! I have been eagerly waiting for my new Liquid Image video camera mask to arrive from Semi Worldwide the local distributors, and now I cant wait to jump in and see how it works. We are all familiar with the Gopro cameras this is similar, but you dont have to hold the camera or attach it to your gun ... and land up getting shaky footage when the gun recoils. It looks a little odd, but you seriously dont notice it when the mask is on your face. The mask is HD1280x720 so it is more than good enough for dvd quality, and it also has a 5 mega pixel stills camera...... killing 2 birds with one stone! It looks like there will be some diving this weekend so I will be sure to take it a long. I will keep you posted. Go check out the Liquid Image web site. 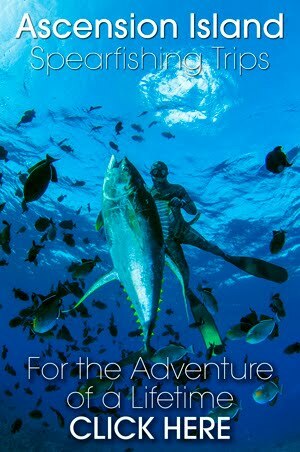 The New Ultimate Spearfishing Magazine Web Site. 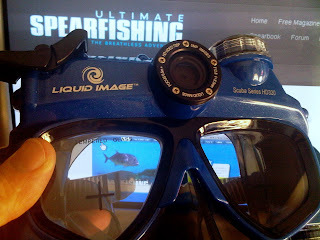 After a week of being down the Ultimate Spearfishing Magazine web site is back up and cooking! The old site was a little slow and had some glitches with old browsers, so the guys at the mag decided to overhaul the site and make it more user friendly. I dont think this is one of those things that just goes away, unless we make a firm stand I think this will be just another failure of the apathetic South African. There is a lot of complaining going on, and many letters sent to the 'Minster' or to where ever the listed address goes. I am sure the 'Minster' does not read even a percentage of them ....let alone reply! I got all excited when I saw a news clip entitled "State defends increase in fishing permit levies". I quickly droped everything to read the article and see if there was any answers to this whole thing. Well ..as you guessed nothing ..... well only one line, "PROPOSED increases in the cost of fishing permits will help the Marine and Coastal Management authority enforce regulations and protect SA’s fishing resources, environmental affairs spokesman Zolile Nqayi said on Friday"
PROPOSED increases in the cost of fishing permits will help the Marine and Coastal Management authority enforce regulations and protect SA’s fishing resources, environmental affairs spokesman Zolile Nqayi said on Friday. He was responding to an outcry among fishermen and the media last week after the gazetting of proposed new levies on fish caught in South African waters — both for the commercial and recreational sectors — harbour fees and other activities such as shark-cage diving and boat- based whale watching. The most controversial proposals include increasing the cost of a recreational fishing permit 567% for catching crayfish, to R500 from R75, and 300% for spearfishing, to R300 from R75. In the commercial sector, the levy on hake has increased 71% to R350 a ton from R205 a ton. Angry recreational fishermen, writing on the South African angling and boating community website Sealine, suggested that the steep increases were unaffordable and would simply increase the amount of illegal fishing activity. They questioned how the coastal management authority was spending the money raised from such fees and suggested that hikes could be lower if its enforcement was more effective. “Commercial vessels come in after hours in Hout Bay, offload their catch and do not pay any levies, because there are no fisheries officers who want to work overtime and weigh the catch, so the commercials just walk away scot-free. Where is the justification here?” one commentator wrote. Nqayi said the proposed rises for recreational fishing were generally inflation-related and took account of affordability. For example, the cost of a permit for a subsistence fisherman had risen only 10% to R6. For commercial fishing, the proposed increases were still affordable. For some guys Couta are just a myth, eluding them on every dive. Well so it seems ... Rat has been one of those guys, its been a 2 cuta seasons and no joy. Well that was until this morning! The water was not half bad and we headed out to the deep. The current was reverse and it was very good for about an hour before the thermo-cline pulled in. 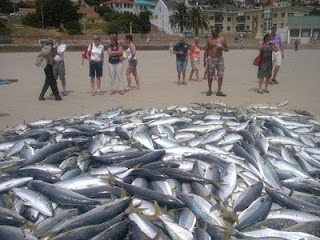 We turned around and headed shallower to look for snoek and all of a sardine..... there are some Couta. I plucked one as it went under my flasher, Rat got one out of a shoal while sitting on the reef. I guess there is no better way to shoot a Couta than when you see them come in while on the bottom. I guess thats what makes this such a wonderful sport. With the whole hike on license fees MCM - Marine and Coastal Management will have some explaining to do. On top of that MCM are also trying to sort out who runs them. Or should I say the governmental departments are fighting over who runs MCM. I cant help but wonder if all these price hikes have something to do with this split in the departments and MCM? All I can say is it just sounds like the mess that is MCM is ...looks like it is only going to get worse. Best of all its going to cost us a whole whack more! Typical government pay more for less! Marine scientists, fishermen and trade union Nehawu claim the government is crippling the fishing industry by proposing to divide fisheries functions between two departments. During his government restructure last year, President Jacob Zuma incorporated the fisheries functions into the newly created Department of Agriculture, Forestry and Fisheries (Daff), moving it from the control of the Department of Environmental Affairs (DEA). Last week, Razeena Omar, acting deputy director-general of marine and coastal management, which falls under the DEA, called a meeting with Nehawu representatives to inform them that a final proclamation was about to be signed by Zuma detailing a further split in research and coastal management functions. The union has condemned the public declaration, saying certain senior officials had driven the process to create "fiefdoms" for individual officials. In terms of the proclamation, conservation and environmental functions will be separated from fisheries functions - a move which Rhodes University ichthyology professor Peter Britz said would be "impractical and hugely damaging to the government's ability to administer the Marine Living Resources Act". "It is a turf war between two departments as to who has a mandate," Britz told The Times. In a letter to Daff minister Tina Joemat-Pettersson, Britz said it was impossible to split MCM without damaging service delivery. "The organisation should be ring-fenced and moved entirely to Daff." Shaheen Moolla, director of marine regulatory law company Feike, said the split had caused confusion as to who was really in charge of fisheries. The ANC Overberg Interim Fishing Desk members also wrote to Zuma this week urging him not to sign the proclamation. Zuma has visited the poor fishing community twice to hear their requests for fishing to fall under one minister and one department. Presidential spokesman Zizi Kodwa said Zuma was "aware of the concerns raised by different interest groups". It is surprising these fools get anything done! As you can imagine, I am privy to quite a lot of correspondence relating to issues affecting us all as a recreational user group. Having said this I would like to bring to the attention of all of you a letter addressed to the Minister of Water and Environmental Affairs - Revenue Office. While this letter is as brilliant as most well constructed and thought provoking letters which convey the attitude and sensibility of a reasonable man, I feel that this one particular letter has summed up in a unique way how so many of us really feel but have trouble in trying to put into words without screaming and swearing at the top of our voices. I would like to thank Ryan Altern for constructing this letter for the benefit of all of us and for allowing me to forward his message on to you. Thank you for your support and please keep those letters flowing to the powers that be. Its with great concern that I write this letter with regard to the proposed price increase in recreational fishing fee's. Most years I purchase licences for cast netting, shore angling, mollusc collecting, west coast rock lobster as well as spearfishing. My wife gets the same (which will cease to happen should the proposed increases be implemented) I'd certainly also only bother with Spearfishing and Rock lobster licences meaning that from my 2 person family you'd go from 10 licences at R75 (that's R750.00) to 2 licences at R300 (that's R600) and the same amount of fish/lobster would be removed. This equates to a R100 loss for you and I guarantee it will be the same in other houses. My Father and brothers have already said that they will simply not get licences. That aside, I feel that there is a serious ecological threat in what you propose as it will mean less users of our oceans. While you may think this is the point, what you'd be missing is that fact that while a boy is catching fish with his dad (an activity that now would cost R400 in licences alone) he develops a love for the ocean and desire to protect it. I'd venture to say that private organisations and individuals do far more for our oceans than your government organisation does and all on private funding. More ocean users means more eyes out for those abusing the resources. I am an ocean lover and spend on average more than 9 hours a week in the water. 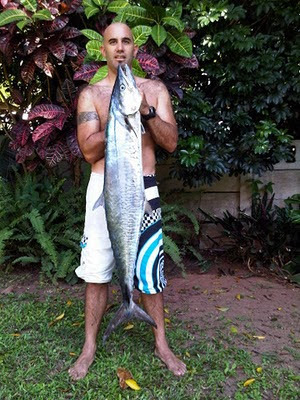 I take a on average one fish a week while spearfishing and 6 crayfish a week while in season. I catch harders (southern mullet) on average 4 a week. When I say "I" it includes my wife as well. I've pointed out/reported poachers on more than one occasion and while I'm in the water keep an eye out for illegal behaviour. I clean the beaches I use of litter etc and enjoy myself doing it. The point is that I was once that boy fishing with dad and it didn't cost us R400 for licences in order to learn, develop and practice my love for the ocean. If it had, I assure you we'd not have done it and we would not have another responsible passionate and dedicated defender of our oceans as we do now. In short the proposed fee's are short-sighted and irresponsible. 10% would be acceptable, 20% should require serious motivation and there should be no reason to go much higher than that. Manage what you already have correctly and there will be far more money to go around without this short term proposal coming to being. There has been a lot of angry people out there over the proposed fishing licenses / permit price's. Fishermen are furious about massive hikes of 200 percent to 400 percent for recreational angling fees and there are fears that the cost of supermarket and restaurant fish will also rise because of heftier levies on commercial fishing. The cost of an annual recreational angling permit is set to rise from R69 to R200 from the beginning of May, along with crayfish permits (from R75 to R500) and spearfishing (from R75 to R300). Added to this, skippers of recreational fishing boats will have to pay an extra R500 a year. Plans to charge an extra R30 "application fee" for recreational angling have also caused confusion. Water and Environmental Affairs Minister Buyelwa Sonjica has given the public a month to comment on the proposals, but her failure to publish any rationale for the hefty hikes has added fuel to the fire. Media officers from Sonjica's department and her Marine and Coastal Management division (MCM) did not respond to queries yesterday. However, anglers have already started venting their anger on fishing websites and to angling magazines about the latest "thievery". Cape Town angler Gary Thompson suggested the new fees would be counter-productive because several anglers would now risk fines rather than buying licences. Poorer fishermen, he said, could not afford the increases. 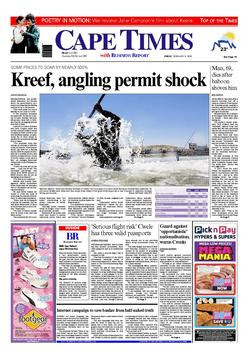 SA Deep Sea Fishing Angling Association spokesman Hymie Steyn has also drafted several questions to put to Sonjica about the amount of money raised from angling permits during 2009, and how this was spent. Rudy van der Elst, director of the Durban-based Oceanographic Research Institute, was also surprised about the scale of the hikes. Another fear was that if fishermen refused to pay the new fees, years of data gathered on fishing trends and effective management tools could be in jeopardy. Commenting on separate hikes in commercial fishing levies, Van der Elst said it was inevitable that the consumer price of fish would also rise, particularly for sardines and anchovies. But from a conservation perspective, there could be positive impacts for over-exploited fish species, as some commercial fishermen would switch their attention to less-exploited fish, or simply look for new business opportunities outside of fishing. Dave Rorke, managing editor of Ski-Boat magazine, noted in a recent editorial that Marine and Coastal Management ran out of money in 2008 and could not afford to pay its phone and electricity bills, raising questions about its ability to administer the Marine Living Resources Fund, which is supported by angling fees and permits. The department's fisheries and environmental protection boat Sarah Baartman had also been hired out to PetroSA as a standby safety vessel and guard ship - yet now there were plans to invest in a new R1.3 billion polar research ship at a time when Sonjica and her deputy, Rejoice Mabudafhasi, had splashed out on a new Mercedes S350 (R796 000) and a BMW X5 (R900 000). Law enforcement against illegal commercial fishing remained weak, with provincial conservation agency Ezemvelo KZN Wildlife complaining it had no money to patrol or buy equipment. When are these fat cat useless politicians going to be accountable? I have received the following from Richard Bruno head honcho at SAUFF. It is imperative we all reply to the Minister of Water and Environmental Affairs. Please reply in clear calm words and provide sensible reasoning why the increases are far too high and unfair. We need to reply by the end of this month, FEBRUARY 2010. You do not have to write a lecture if you do not want to. Even just one sentence will do. what your sentiments really are. I simply cannot afford to pay these proposed fees for recreational fishing / spearfishing. Do you have your Vaseline ready? Well you better because you are about to be screwed!! I have just received notice from the SAUFF guys on the new fees structure, and it is not a pretty sight. A subsistence fishermen goes from R5 to R6 per year. We have one month to write to them with our “public comment”.! JUST LIKE THAT FOLKS !!!!! Folks please send this out to all your contact lists even if they are listed above. Comments should please include myself so that I have as many views as possible before submitting SAUFF’s comments. I think I am going to become a subsistence fisherman, I pay R6 and have no limits or restrictions. Where is the conservation and justice in this?